I have been dreaming about Madelines for the last couple of weeks. Even checking out to get a silicone mould but some how, it got procrastinated. Now this post is definitely nudging me. shirley you are on fire with these cookies! Can I come over? please? The way you described this madeleine has convinced me. It sounds incredible. And the moisture and flavor from the caramel - and the apricots - sound SO delicious! Shirley, the madeleines look gorgeous and summery flavours too! 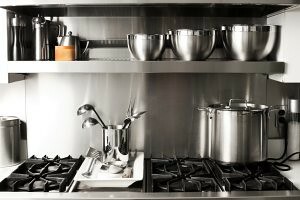 Are you using a metal mold or silicon ones? Thought of buying some to try baking some of this. Hmm but that means having to find space in my limited storage for another baking pan. Sigh! Super pretty. Can you bake me some when I fly back for a visit? You make madeleines even more beautiful than the Paris pastry shops Shirley! You are so lucky to have bought the Pierre Herme book - I wonder if they have one in English! I've got one in French but have been too lazy to try to translate - your posts are giving me inspiration. Hi Shirley, sure looks good. Classy too. I guess 5 pieces will do me fine, with iced coffee, ha ha. You sure can bake them.....good for you! Have fun and keep well. Shirley, I am convinced! 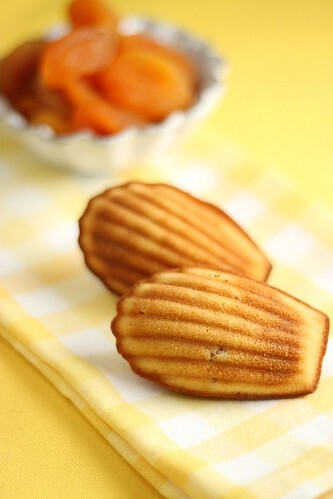 Gorgeous photos of your lip smacking madeleines. Got to ge hunt for the moulds now and try this out. Ditto Edith's comments. What type of moulds did you use? Silicon or metal ones? Thanks for sharing the PH recipe. yours turned out so much prettier than those from "Le livre des four secs et moelleux de Pierre Herme". I really adore the pronounced line effects. I have been thinking about baking Madeline lately but just didn't want to go with the usual flavors. Your caramel and apricot flavor seems really inviting! Will try! the caramel in this won be over. 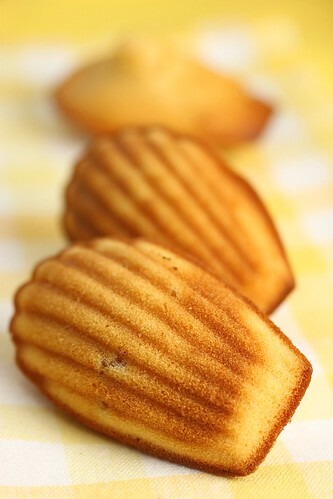 I'm often not sure about madeleines- because they can turned into sponge cakes if cooked wrongly! yours look perfect and one day..just one day... i will have the guts to attempt! I like the addition of apricots. 2. In my recent baking class in HK, the pastry chef said we can use corn syrup as inverted sugar and don't need to bother getting glucose. True ah? I adore fruits in my baked goodies, with caramel also nothing more i need! looks gorgeous! Shirley, these Madelines are very nice and yummy. they looked really pretty and elegant. perfect tea time snacks! Sigh. Do u know i've not baked madeleine before? And here u are tempting me with the caramel version! I NEED TO GET THE MOLDS SOON! Your madeleine looks so pretty! Just perfect! 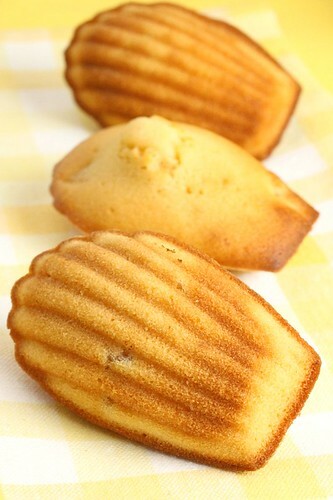 Love madeleines. They're delicious. Lavender makes great ones. The bakery's in Mid Valley mall.